Glow-in-the-dark highways: Netherlands roads light up with snowflakes when cold. 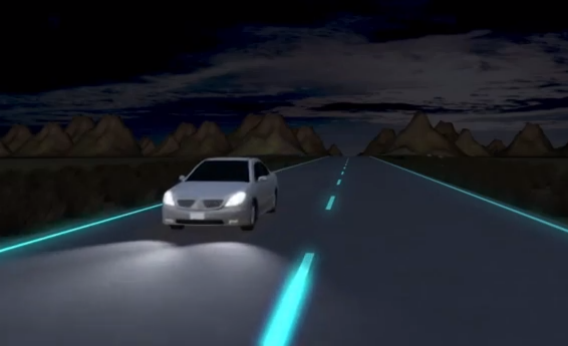 Why Can’t We Have Glow-in-the-Dark Highways Like the Netherlands? The Netherlands is experimenting with photoluminescent road markers that light up at night, among other innovations. Wired UK reported in October that the Dutch design firm Studio Roosegaarde and infrastructure management group Heijmans have come up with a “smart highway” concept that will replace standard road markings with photoluminescent powder that charges in the daylight and glows through the night. When the temperature drops below freezing, the road will automatically light up with snowflake indicators to warn drivers of possible ice, sort of like the Coors beer cans that turn blue when they’re extra cold. Whether any of that will actually make drivers safer remains to be seen. (Personally, I’d rather see these guys collaborate with Coors on a special paint that makes cars glow in the dark when their drivers are full of alcohol.) The Netherlands is wisely starting small, with a pilot project in the province of Brabant scheduled to begin later this year. But those are only the first two stages of the grand Dutch plan to put our highways to shame. The next steps include windmills that light up as cars pass by, and “induction lanes” that would charge electric cars while they drive. The video below offers a rough illustration of what this might look like. Even if it turns out not to work as seamlessly as the video suggests, the innovative spirit behind the concept is admirable—and sorely missing from U.S. infrastructure planning. The design firm behind the project says it would like to bring the concept to the United States eventually, but Americans shouldn’t hold their breath. Current levels of infrastructure spending are barely sufficient to maintain our “D” grade from the American Society of Civil Engineers and our 23rd-place global ranking from the World Economic Forum.